Joshua London Welburn was the 14th child of Mary & George Welburn known to survive to adulthood. He was born September 21, 1862 in the farming community of Blackwater. 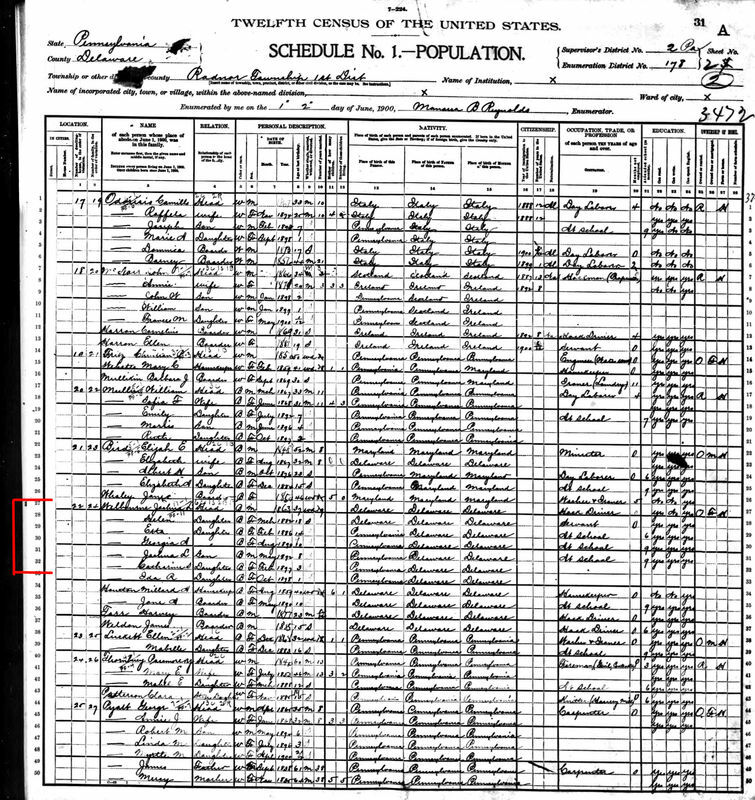 He makes his first appearance in the 1870 Federal Census for Sussex County, Delaware. Joshua married his first wife, Mary Long, about 1881 in Delaware. She died about 1899. He married his 2nd wife, Victoria Kennedy, in 1903 in Philadelphia, but by 1910 she is no longer residing with him. Joshua's family resided in Radnor, Wayne, and finally Philadelphia, PA. His final residence address was 1315 Ogden St (rear). His occupations were varied: hack driver, teamster, and furniture mover. He reported that 8 children were born during his first marriage, but only 4 had survived through 1910. Joshua Welburn died April 5, 1920. According to his death certificate, his death resulted from the injuries sustained in his home on Ogden Street and was ruled a homicide. The whereabouts of all his descendants remains unknown at this time, and they may spell their surname Welborn, Welbourn, or Welbourne. WHITE=CHILD OF JOSHUA & MARY; RED=GRANDCHILD OF JOSHUA & MARY; PURPLE=GREAT-GRANDCHILD; MINT=2XGREAT-GRANDCHILD; ORANGE=3XGREAT-GRANDCHILD; BLUE=4XGREAT-GRANDCHILD; YELLOW=5XGREAT-GRANDCHILD; GREEN=6XGREAT-GRANDCHLD; ADD ANOTHER "GREAT" TO KNOW THE RELATIONSHIP TO MARY & GEORGE WELBURN. Requests for additions and/or corrections to this outline of descendants should be emailed to webmaster@GrayWelburn.com. This webpage was last updated on 1/21/2014.